Over the years, the pages of Air & Space have been filled with the adventures of naval aviators: from a collection of love letters, written by Marine Aviator #4 in 1916, to the story of helicopter pilots who fly search and rescue missions from aircraft carriers. 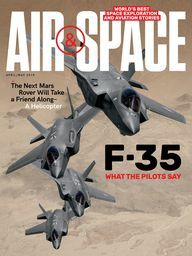 On this site you’ll hear from the pilots and designers of the most famous Navy fighter that ever flew—the Grumman F-14 Tomcat—and from the first pilots trained to fly the V-22 Osprey tiltrotor. But as broad as our coverage of naval aviation has been, these features alone may not satisfy your curiosity. That’s why we’ve compiled the above list of 100 ways to help the U.S. Navy celebrate 100 years of aviation history.